Car interiors present a unique set of challenges for vacuum cleaners. Within the narrow crevices and tight fits, crumbs, dust bunnies, pet hair, and other debris collects—always seemingly just out of reach. For most of us, cleaning the car requires a trip to a nearby carwash and a fistful of quarters. The alternative is lugging our household vacuum out to the driveway, untangling a nest of extension cords, and attempting to navigate the cumbersome body of the machine within the tight confines of the car. Because of these challenges, cleaning the car is often neglected until the mess becomes too unsightly to ignore. For pet owners with allergies, the mold, dander, and pet hair that builds up in the upholstery can make daily commutes an unpleasant experience. Luckily, there are more convenient tools for cleaning car interiors. One solution is a dedicated car vacuum with a 12V adapter, which plugs into the cigarette lighter and runs off the car battery. Alternatively, you can use a compact battery-powered handheld model for the same task. We wanted to find out the best car vacuums on the market today. We compared price, design, and all-around performance, as well as how well each one removed pet hair from upholstery. We looked for long crevice tools to reach into tight spaces, as well as each model’s reliability, power and battery life. After picking our favorites, we took at the strengths and weaknesses of each one, to help you choose the model that best suits you, your car, and your lifestyle! The Black & Decker BDH2000PL MAX Lithium Pivot is a lightweight but powerful cordless handheld machine with a distinct appearance. It’s distinguished by a thin, rectangular pivoting nose that’s especially designed to fit into narrow spaces. It’s one of the most popular handhelds on Amazon, with thousands of 5-star ratings from satisfied customers. Reviewers praise the long battery life and powerful suction of the MAX Lithium Pivot, and many owners say that it makes a perfect tool for cleaning car interiors. The pivoting nose of this machine can rotate a full 180°, which allows for easier access to tough-to-reach spots like cracks in the cushions or spaces under the seats. The nozzle has an on-board brush that can be flipped up to clean upholstery, as well as an extendable crevice tool for tight spaces. The MAX Lithium Pivot is a lightweight 4.3 pounds, and it includes a charging cradle that can either stand on the counter or hang on the wall for easy access. It also features a washable, see-through dust canister that allows you to see when it is getting full. This 20V machine is powered by a lithium ion battery, an upgrade over the nickel cadmium batteries used in older hand vacs. Lithium batteries charge faster, last longer, and don’t lose suction as the battery drains. It takes roughly 2-4 hours for the MAX Lithium Pivot to reach full charge, after which it can run for a continuous 15 minutes. The BDH2000PL has a 3-stage filter, with cyclonic technology that spins dust particles away from the filter. The filter is washable, and the canister is easy to empty via a latched door on the side of it. The updated battery and powerful motor behind the MAX Lithium Pivot generates an impressive amount of suction that doesn’t fade as the charge diminishes. The suction power is strong enough to lift large debris and small, fine particles embedded in the car upholstery. The 15 minutes of battery life provided enough time to clean the whole car interior, according to owners. The lithium ion battery is a big improvement over older NiCd batteries, which typically had a lifespan of 2-5 minutes and caused vacuums to lose suction power as they faded. Though it works well as a household vacuum, the design of the BDH2000PL seems tailor-made for car interiors. The thin nozzle makes for easy access into the narrow gaps around the consoles and seats, and the extendable built-in crevice tool adds a few inches to your reach. The pivoting nose spares owners the usual contortion required to clean under the seats. “This is one handy dandy little machine. Great suction and so easy to manipulate it in order to get into the crevices and hard to reach areas….I definitely recommend this! Works wonders for cleaning the car! Pet owners report that the MAX Lithium Pivot is a great tool for picking up pet hair, with enough suction to pull clinging hairs from the upholstery. For the more stubborn hairs, the built-in brush tool comes in handy. Simply flip the brush forward on the nozzle for enhanced pet hair removal. Finally, the MAX Lithium Pivot is as easy to maintain as it is to use. The dust canister has a simple latch to dump debris from the side when the vacuum is full. The canister itself can be removed via this opening, along with the filter for more thorough cleaning. Though the MAX Lithium Pivot delivers good results on most pet hair, long hairs tend to get stuck in the narrow nozzle of the vacuum. 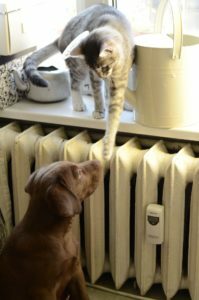 If you have a long-haired dog or cat, you may be forced to stop and dislodge pet hair from time to time. A handful reviewers complained that filter required frequent cleaning, despite Black & Decker’s claim that their cyclonic tech reduced the amount of dust that reaches the filter. 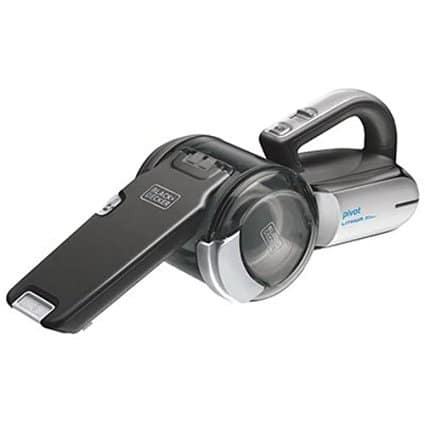 The thin, pivoting nose of the Black & Decker MAX Lithium Pivot and cordless design make this vacuum a great choice for cleaning your car. 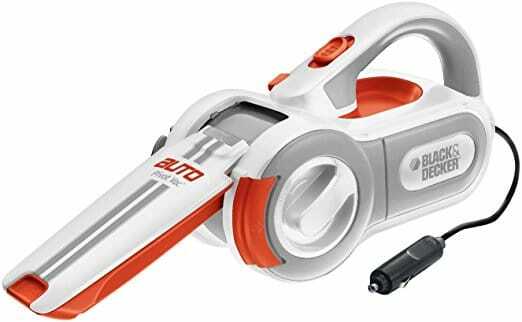 It comes with a lot of great features for a reasonable price, including built-in crevice and upholstery brush tools, a no-fade lithium ion battery, and an easy-to-empty dust canister. With good suction, strong pet hair perfomance, and respectable battery life, the MAX Lithium Pivot has all the qualities of a good car vacuum for pet owners. With thousands of glowing reviews from satisfied customers, it’s no wonder this vacuum is one of the top corded models on the market today. Dyson is one of the best-known vacuum companies in the world, and their V6 line has earned them high praise from experts and customers alike. The Trigger is the handheld model from the V6 family, and the compact little vacuum packs just as much power and performance as its bigger siblings. The Trigger weighs roughly 3 pounds, and (like the MAX Lithium Pivot) it is powered by a fade-free lithium ion battery. It features a trigger control for operation—meaning the vacuum only runs when the trigger is depressed to conserve battery life. Users also have the option to switch to a boosted “power mode” for tackling more stubborn messes. In normal mode, the battery life is roughly 20 minutes. In power mode, the battery lasts for about 6 minutes. It takes about 3.5 hours to reach full charge. The Trigger also features a lifetime washable filter, as well as Dyson’s cyclonic technology—the tubular apparatus that sits on top of the canister. These 15 cylinders create centrifugal force inside the vacuum to capture more fine dust particles and improve airflow. The dust canister features a one touch quick-release for hygienic waste disposal. The Trigger also includes a crevice tool and a combination attachment (a retractable crevice tool inside of upholstery brush). Dyson backs this vacuum up with a two-year warranty. 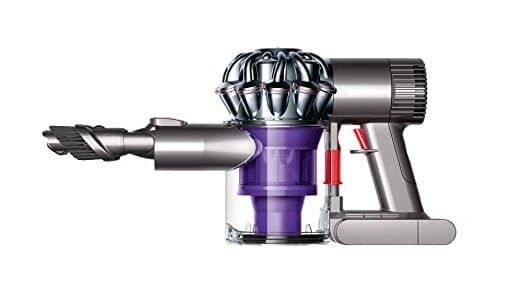 Dyson boasts that the V6 Trigger has more suction power than any other handheld vacuum, and fans of this compact little powerhouse seem to agree. Normal mode is sufficient for most household tasks, but power mode is a useful feature to have for deep cleaning and stubborn pet hairs on upholstery. One of the biggest strengths of the V6 trigger is its ease of use. It’s lightweight, making it easy to wield for extended periods of time. The trigger doesn’t require very much pressure at all, and prevent wasting the limited battery life when you’re not vacuuming. The one-touch bin dumping makes emptying the dust canister a hygienic process, and spares you the trouble of having to interact with allergens. The Dyson lithium ion battery is the best we’ve come across, requiring the least amount of charging time for the longest battery life of any cordless handheld vacuum we reviewed. Like the MAX Lithium Pivot, the Trigger won’t lose suction power as the charge wanes. Like most of Dyson’s products, the Trigger’s souped-up performance also comes with a souped-up price tag. At roughly twice the cost of our other vacuums, the Trigger falls out of many shopper’s budgets for a handheld vacuum. The bin is also on the smaller side, so the Trigger requires frequent trips to the trash can to empty. If you’re cleaning the car, we recommend taking a trash bag with you. If top-of-the-line performance is your goal, the Dyson V6 Trigger is the vacuum for you. This lightweight vacuum has twice the power of any other handheld vac on the market, and offers the quality of design and build that has made Dyson a household name. Many shoppers may shy away from the Dyson’s high-end price tag, but if you’re looking for the best of the best, the Dyson V6 Trigger is the handheld vacuum for you. As mentioned above, there are two types of vacuums that work best for cleaning your car. The first type is the cordless, battery-powered kind like the Dyson Trigger and the Black & Decker MAX Lithium Pivot. The second type features an adapter that plugs into the 12V outlet in your car. Unlike battery-powered models, these car vacuums aren’t limited by the charge in the battery—although you have to be careful not to run down your car battery while using these models. Among corded car vacuums, our favorite is the Black & Decker PAV1200W. This handheld vacuum features a very similar design to the BDH2000PL, with a thin, flat nozzle that pivots into tight spaces and a built-in extendable crevice tool. Unlike the cordless model, however, the upholstery brush for this vac is included as separate attachment. Black & Decker also includes a useful hose tool for improved reach, as well as a storage bag for the vacuum and attachment. The power cord for this vacuum is 16 feet long. The PAV12000W also includes cyclonic technology to keep the filter clean longer and the suction going strong. There’s a convenient “filter refresh” knob, which clears debris from the surface of the filter. When it does come time to wash the entire filter, it can be washed in running water or the dishwasher. As mentioned before, the primary advantage that the PAV1200W has over our other picks is its power cord—owners can vacuum their entire car without worrying about the battery running out. The PAV1200W has all the design advantages of our top pick—the thin, pivoting nose allow for easy access to narrow, hard-to-reach spaces, and the crevice tool on the end of the nozzle extends this vacuum’s reach further. With the addition of the flexible hose and long power cord, there’s no spot in your car than can escape the reach of this vacuum. Pet owners report that the upholstery brush attachment works well on pet hair, even when the hair has woven itself into the fabric of the car interior. The vacuum also did a good job of picking up debris large and small, including crumbs, dust and small rocks. Convenience is one of the PAV1200W’s greatest strengths. The vacuum can be folded up and stored easily in the accompanying bag, and features an electrical cord wrap to keep the ensemble neat. It’s also an easy vacuum to maintain. The dust canister can be emptied into a trash can via a one-touch side latch, ensuring owners never have to come in contact with the debris inside. The filter refresh knobs spares owners the constant filter cleaning that plagues most handheld vacuum, and the dishwasher-safe material makes the filter easy to clean when it finally becomes saturated with dust particle. The suction behind this vacuum is somewhat limited by 12 voltage power source, and it’s not the best choice for deep cleaning your car interior. The PAV1200W is a good tool for routine surface jobs, but lacks the necessary power to pull fine particles embedded deep in the upholstery. The Black & Decker PAV1200W may not have the strongest suction, but what it lacks in power, it makes up for in convenience. It’s a very useful tool to have on hand, especially for road trippers or frequent commuters. RV, truck, and van owners will also benefit from keeping one of these nearby. The design of this corded vac allows you to reach every corner of the car, without the limited run time of cordless models. With an array of useful attachments, easy maintenance and convenient storage, the PAV1200W is a strong choice for your next car vacuum. Which is the Best Vacuum for Cars? Our favorite model is the Black & Decker MAX Lithium Pivot, a handheld battery-powered vacuum with a lot of suction. The design of this vacuum makes it well-suited for cars—the thin nozzle and crevice tool easily reach between seats, and the upholstery brush works well for pet hair. With a respectable battery life and reasonable price, this cordless vac is a great buy! For the ultimate power in cordless handhelds, check out the Dyson V6 Trigger. This sleek, lightweight vacuum has twice the suction of competing models, and a longer battery life than any cordless vacuum we reviewed. Dyson continues its reputation for high quality in the V6 Trigger, and this handy little powerhouse works great for cleaning out the car. Our favorite corded car vacuum, the Black & Decker PAV1200W, has a similar body design to our top pick, with the added benefit of a 12V car adapter as a power source. It’s a super convenient model to keep on hand for extended trips, and it makes quick touch-ups of your car interior a breeze! For more reviews and deals on these and other vacuums that work great in your car, check out the best selling handheld vacuums on Amazon!